Door Gert Meijboom op 9 april 2011 om 21:55, in de categorie App Sunday en Apps. Voor de liefhebbers van Atari en retro games is er een app op de markt met honderd Atari-games. De app voor iPhone en iPad is onderdeel van de Pong-app en bestaat uit 25 losse packages, die je voor $0.99 per package kunt komen. Je kunt ook de hele bunch van 100 games in een keer kopen voor $14.99. Een aantal games hebben zelfs een update gekregen en beschikken over een local Bluetooth multiplayer. 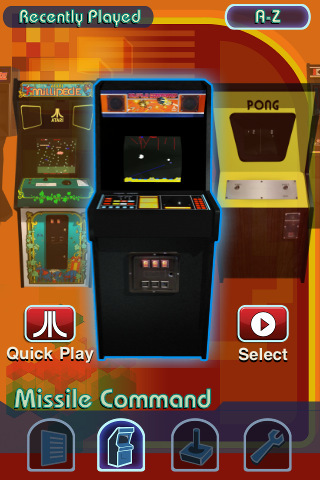 De greatest hits van Atari zijn in ieder geval te koop in de Amerikaanse app store van Apple. Asteroid Pack: Asteroid, Asteroid Deluxe, Asteroids 2600, Canyon Bomber (Bluetooth multiplayer), Battlezone Pack: Battlezone, Red Baron, Air-Sea Battle (Bluetooth multiplayer), Submarine Commmander, Centipede Pack: Centipede, Millipede, Centipede 2600, Millipede 2600, Black Widow Pack: Black Widow, Space Duel (Bluetooth multiplayer), Desert Falcon, Space War, Crystal Castles Pack: Crystal Castles, Crystal Castls 2600, Surround (Bluetooth multiplayer), Maze Craze, Gravitar Pack: Gravitar, Gravitar 2600, Radar Lock, Demons to Diamonds (Bluetooth multiplayer), Star Raiders Pack: Star Raiders, Liberator, Star Ship (Bluetooth multiplayer), Human Cannonball, Missile Command Pack: Missile Command, Missile Command 2600, Fun with Numbers, Flag Capture (Bluetooth multiplayer), Lunar Lader Pack: Lunar Lander, Sky diver (Bluetooth multiplayer), Video Pinball, Code Breaker, Super Breakout Pack: Super Breakout, Breakout (Bluetooth multiplayer), Off the Wall, Circus Atari (Bluetooth multiplayer), Tempest Pack, Tempest (Bluetooth multiplayer), Tempest 2600 (Bluetooth multiplayer), Outlaw, Atari Video Cube, Majar Havoc Pack: Major Havoc, Secret Quest. Sentinel, Yars Revenge (Bluetooth multiplayer), Warlords Pack: Warlords (Bluetooth multiplayer), Warlords 2600, Combat (Bluetooth multiplayer), Combat 2 (Bluetooth multiplayer), Adventure Pack: Adventure, Haunted House, Return to Haunted House, Save Mary, Tic-Tac-Toe Pack: 3d Tic-Tac-Toe, A game of concentration, Backgammon, Brain Games, Fatal Run Pack: Fatal Run, Dodge ‘Em, Night Driver, Street Racer (Bluetooth multiplayer), Quadrun Pack: Quadrun, Slot Racers (Bluetooth Multiplayer), Stellar Track, Math Gran Prix, Casino Pack: Casino (Bluetooth Multiplayer), Slot Machine, Video Checkers, Video Chess, Sword Quest Pack: Swordquest Earthworld, Swordquest Fireworld, Swordquest Waterworld, Sprintmaster, Championship Soccer Pack: Championship Soccer (Bluetooth Multiplayer), Golf, Double Dunk, Basketball, Football Pack: Football (Bluetooth multiplayer), Home Run, Miniature Golf, Bowling, Real Sports Basketball Pack: Realsports Basketball (Bluetooth multiplayer), Realsports Boxing (Bluetooth multiplayer), Realsports Tennis (Bluetooth multiplayer), Realsports Baseball (Bluetooth multiplayer), Real Sports Football Pack: Realsports Football, Realsports Soccer, Realsports Vollyball, Video Olympics (allemaal met Bluetooth multiplayer), Battlezone Pack: Battlezone 2600, Super Breakout 2600, Super Baseball, Super Football, Hangman Pack: Hangman, Black Jack, Steeplechase.